With my new catalog order and my catalog preorder, I've been spending some time organizing lately. I mean, I HAD to check out all the stuff I splurged on after my "bad day at work shopping spree." First, I get a roll of magnet paper from a local store. I don't spend much and I use every inch. I cut the magnet paper the size of the paper insert in the envelopes and use Tear Away Tape to adhere the magnet to the paper. 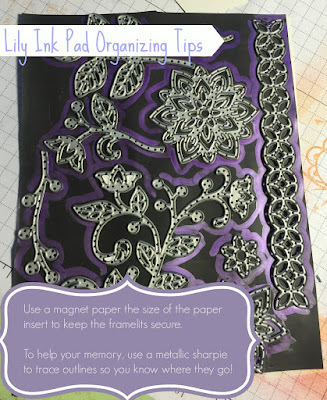 I then outline the framelits in metallic sharpie. This time I used PURPLE. So fun. Before I put them away, I can tell if one is missing and it makes it easier to get them all to fit on the magnet. There are many ways to store framelits. I prefer to keep them in their envelopes and I keep those in a Ikea old tin bin that is the width of the envelopes. Ikea no longer carries them. but it works for me. I've also tried a basket and that was worked well, also. I like things with lids to hide my stuff. (although, I keep the lids off for access most of the time).